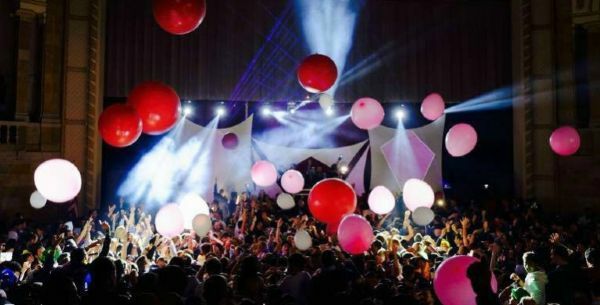 Experience the most saught after NYE party in Kansas City. • Food Options available from local Kansas City food truck — Slater’s. Do it right this year at the best NYE party in Kansas City. Once again, join over 2,500 young professionals for New Year’s Eve. Dance the night away in KC’s historic Scottish Rite Temple. Located on the edge of the historic Hyde Park district of Kansas City (blocks from Martini Corner), the Scottish Rite Temple will blow you away! Hand-carved columns and intricate chandeliers will act as the backdrop for an evening of elegance and style. Add in special lighting, lasers, gigantic dance floors and numerous secluded party rooms and you have an evening that will create memories that last for a lifetime. This event sells out every year, so plan ahead. Dress to impress. Male dress code is “business casual.” You don’t have to wear a tie, but dress like you are applying for a management position. (That means: no hats, tennis shoes/sandals/work boots, shorts, T-shirts, jerseys, athletic attire, denim jeans, baggy pants, etc.) A collared button-down shirt and nice slacks is ideal. Please, gentleman, this is strictly enforced.